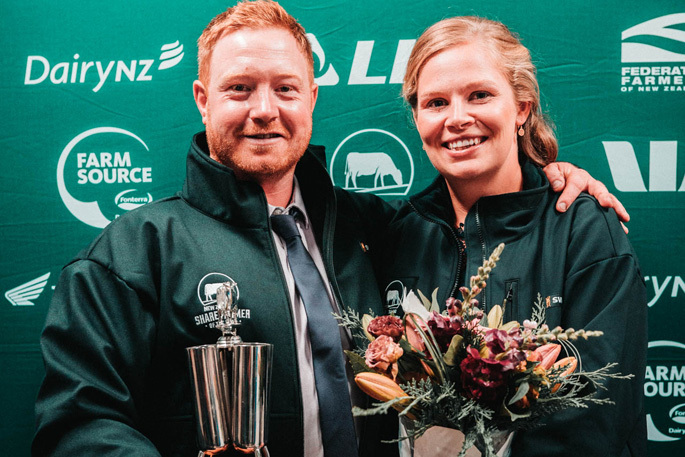 The 2019 Waikato Share Farmers of the Year are Marc and Nia Jones. The 2019 Waikato Dairy Industry Awards’ Share Farmers of the Year are first-time entrants who’ve wanted to enter the awards since reading about 2012’s national winners while living in Wales. Marc and Nia Jones were bestowed the regional title at the Waikato Dairy Industry Awards’ annual dinner at the Sir Don Rowlands Centre last month. “This is the first year we’ve been eligible to enter as we are now residents,” says Nia. Joe Kehely became 2019’s Waikato Dairy Manager of the Year, and Matt Dawson is 2019’s Waikato Dairy Trainee of the Year. This is the Jones’ first year contract milking for Margaret and the late Ian Elliott, on their 270ha, 970-cow Tokoroa property. “We thought this was the right time to explore, learn and understand our business better, to see how we benchmark against the rest of the region and nation.” They won $13,750 in prizes and three merit awards. Marc fell in love with the dairy industry on his OE in 2010, when he worked for Ian and Margaret. “Ian has been a mentor to me since then,” says Marc. Returning to the UK, the couple managed a dairy conversion block in Scotland for two years before moving to North Wales to contract milk on a dairy conversion. Waitoa 50/50 sharemilkers Aidan and Sarah Stevenson, both aged 30, were runners-up in this competition, winning $5675 in prizes. They work on Sue Williams 100ha, 340-cow farm. Monique and John Dickson, both aged 25, placed third. They are contract milkers on Steve and Rachel Mathis’ 100ha Tirau farm, milking 340 split calving herd. They won $4100 in prizes and two merit awards. Waikato’s 2019 Dairy Manager of the Year Joe Kehely, who won $9125 in prizes and five merit awards, is farm manager for Craig and Jan Tomalin’s 106ha farm, milking 240 cows in Putaruru. He’s held a passion for the outdoors and farming from a young age and always knew he’d make it his career. Morrinsville farm manager Daisy Higgs, aged 23, placed second in this competition, winning $3800 in prizes and one merit award. She works on Gavin and Maree Haddon’s 91ha, 300-cow farm. Morrinsville farm manager Gursimran Singh Jhalli, aged 24, placed third and won $2775 in prizes. He works on Andrew and Michael Moir’s 85ha Tatuanui farm, milking 232 cows. Matt is assistant manager for Neville Henderson on his 229ha, 620-cow property at Horsham Downs and won $6550 in prizes and one merit award. Runner-up in this competition is 19-year-old farm assistant Crystal Scown, who won $3050 in prizes and one merit award. She works on Euan Reeve’s 260ha, 370-cow Waitomo property. Herd manager Jonathan McBride, aged 24, placed third, winning $1400 in prizes. He works on Matt and Laura Clausen’s 50ha, 154-cow Hamilton farm. The regional winners’ field day was on April 3 at the Tokoroa farm where Marc and Nia Jones contract milk.